A special Thank you to Random House and NetGalley for sending this book for review. 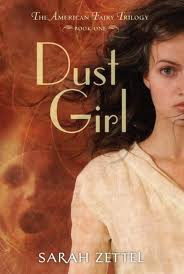 Amid the devastated Dust Bowl in heartland America, the destiny of the fairie world is controlled by one teenage girl. This new trilogy will capture the hearts of readers who adore Libba Bray's Gemma Doyle series. Callie LeRoux lives in Slow Run, Kansas, helping her mother run their small hotel and trying not to think about the father she's never met. Lately, all of her energy is spent battling the constant storms plaguing the Dust Bowl and their effects on her health. Callie is left alone when her mother goes missing in a dust storm. Her only hope comes from a mysterious man offering a few clues about her destiny and the path she must take to find her parents in "the golden hills of the west" (California). Along the way, she meets Jack, a young hobo boy who is happy to keep her company—there are dangerous, desperate people at every turn. And there's also an otherworldly threat to Callie. Warring fae factions, attached to the creative communities of American society, are very aware of the role this half-mortal, half-fae teenage girl plays in their fate. This is a really fun YA read with a fresh twist. It’s a fairy story, but a different kind of fairy story. It’s also tale of self-discovery and empowerment set in the old west, (well, Kansas) just after the arrival of the locomotive. Think fairies + a These is My Words-esque’ setting + action and self-discovery of Percy Jackson. Callie is an spitfire of a heroine filled with creativity and ingenuity, and stubborn, resourceful, heartbroken Jack complements her perfectly. Altogether, a well-spun, tale that will have you wrapped around it’s narrative within a few pages. I loved it and can’t wait for the next installment! Sounds fun, and that cover is just awesome.